There are times when sports give me the urge to stand on my rickety wooden desk (Target, $80 in 2005), brave the first wobbles, and shout some English-based gibberish while gesticulating like an insane maestro. Tuesday night’s Michigan State-Wisconsin finish prompted one of these episodes, and today I can’t restrain myself from thinking this cliché: If I live 1,000 years, there will still be something to surprise me in sports. It never ends. Before the analysis, let’s begin at the end. The Kohl Center in Madison was abuzz in overtime as a typically brutal Badger game — regulation ended with the teams knotted at 50 — had suddenly come to life in the extra time. Jordan Taylor was like a bolt of electricity in the plodding leviathan Wisconsin offense, and his duel with Michigan State’s Keith Appling was approaching a critical point. Halfway through the five-minute session, the game was tied at 54, and that’s when things started going sour for the home team. The Spartans pulled away as the Badgers went cold, and with 30 seconds left, a stream of fans made for the exits with their team down 61-54. Then Taylor hit a 3. 61-57. Twenty-one seconds left. Appling hit his free throws. Taylor hit another 3. 63-60. Ten seconds left. Incredible, amazing, spectacular. But, though the comeback had me inhaling more oxygen than usual between exclamations, this wasn’t the shock I mentioned above. It was rare, and thrilling, but we’ve seen miracles before. The real oddity came into play because of an unresolved question — did Evans’ shot count? The ball is out of Evans’ hands. Notice the yellow arrows in the upper left. One clock says 0.0. The other says 0.1 By the first, the shot is no good. By the second, it counts. On our televisions, ESPN was displaying the second. But the clock above the basket is the one that matters. 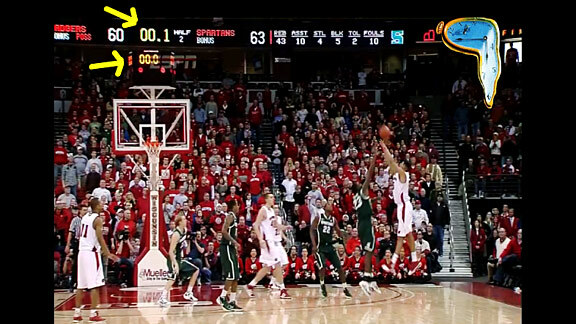 It’s the ultimate arbiter, and Michigan State left Madison with a huge Big Ten win. The whistle is blown, and the ref’s hand raised, by 20.3. The refs eventually decided 20.1 would stay on the clock. At this point, I’m sure I don’t need to remind Wisconsinites what those extra tenths could have meant. My friend Spike even suggested that this is where the clocks got messed up in the first place. Conspiracy! I call this video the “pseudo-cross sickness,” and the part I love the most is how just before he got burned, Evans gave an emphatic clap as if he was about to shut Appling down. That makes the whole thing a little more embarrassing, doesn’t it? Appling gave him a pair of flat feet to go with his flat top. The Spartans have now won 14 straight games after losing two in a row to Duke and North Carolina to start the year, and this win should propel them into the top 10. It’s typical of a Tom Izzo team to look mediocre at the start of the year and slowly build steam until the Spartans suddenly stand at the top of the toughest conference in college basketball. Tuesday night’s game plan was fairly uncomplicated. By the second half, Appling and Green were running pick and rolls on the side over and over, and the former scored eight of his 16 points in a three-minute stretch late in the game. Green ended with 18 points and 14 boards, and other than the missed free throws at the end, proved he was the toughest guy on the floor. 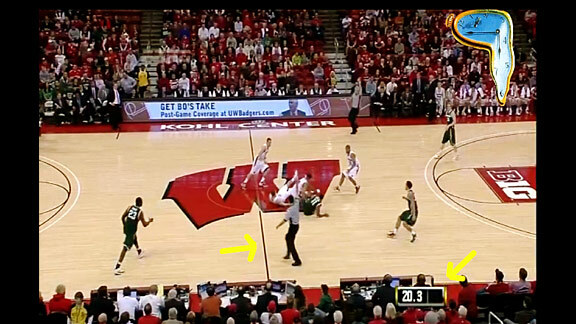 As for Wisconsin, it’s the team’s second straight loss at home, and the first home loss to Michigan State in a decade. Taylor’s excellence somewhat disguised the fact that the Badger offense is struggling to find variety. The defense is strong, but they’ve now lost to all three ranked opponents, plus Iowa, precisely because it wasn’t strong enough. Against teams that can defend the 3-pointer, the Badgers are basically reduced to hoping Taylor can create by himself, and even a superlative effort Tuesday night couldn’t overcome his team’s deficiencies. Bo Ryan unleashed holy hell on the officials when they disallowed the shot, but the zebras had made the right call, and so had the universe. Michigan State played a better game, and it deserved to win. The Badgers are a program designed to crush another team’s creative style, but now they might be forced to come up with one of their own. The bruising slow-down approach isn’t working like it should, and they’ll be an easy second-round target for an athletic team in March.